If your preference is for 'off the beaten track' country getaways, then this glorious little place in rural Dorset might just be what you're looking for; a picture-perfect Grade II listed 18th century inn with bags of period charm. It is ironic, however, that a place boasting literary connections in the middle of Dorset shouldn't actually have anything to do with Thomas Hardy (and whose cottage is but a short drive away). Instead, the Brace of Pheasants is linked to one of the 20th century's most noted writers, Cecil Day Lewis. 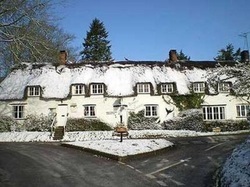 Indeed, it was while staying at the pub that the then Poet Laureate was inspired to write the novel The Deadly Joker under his pen name Nicholas Blake. The book was even dedicated to those who ran the inn at the time of its publication in 1963. There's no doubt the author would still recognise the place today, and almost certainly approve of the design touches to the present day bedrooms. Of these four are located above the pub itself, and another four in the building's old skittle alley.